The HAIER XQJ50-3 Top Load Washer is a portable washing machine that boasts of its space-saving design. This design has enabled the small and lightweight machine to accommodate even 11 pounds of laundry at one time. The portable machine is also equipped with not just the most basic of features and accessories but also with others that help in customizing each cycle. 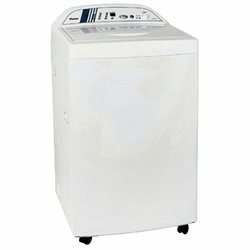 The HAIER XQJ50-3 Top Load Washer offers 4 preset wash cycles. The washing machine has 3 water levels to choose from, which is pretty good for its size. It has 3 temperature levels to choose from, with warmer temperatures designed for the dirtiest laundry. The delayed start feature enables the user to schedule the operation in advance. The delayed start period ranges from 2 to 24 hours. The washing machine operates with minimum noise and vibration. The washing machine has electronic controls and a digital display, for a modern look. The portable machine has dispenser trays for bleach and fabric softener. It can accommodate 11 pounds of laundry at a time. It has separate water inlets, for warm and cold water. It has a removable lint filter for easy cleaning. The washing machine comes with a quick connect sink adapter. It has a 1.6 cubic feet tub, made of stainless steel. It has smooth-wheeling double casters for easy transport. Total volume: 1.6 cu. ft. The washing machine is small and portable. So, it can be stored in a small room in a starter house or apartment. The machine can operate quietly, which means that it cannot cause any significant disturbance. It offers enough types of cycles, water levels and temperatures for customizing each load. The machine comes with a one year warranty. It is easy to wheel to the next location. Its double casters make it easy to transport or to relocate to another room. It is lightweight, which adds to its portability. The washing machine model is affordable. Though small, it can finish a small family’s laundry in about two loads. The electronic controls and display make the model modern-looking and updated. The washing model is small and portable. This is generally an advantage but it can also be a disadvantage as this makes it quite the starter model, disposable. It does not have many convenience features. It does not have special wash cycles for delicate fabrics and dainty garments. It is not Energy Star qualified. Join in and write your own page! It's easy to do. How? Simply click here to return to Haier Washing Machine Consumer Reports.